Clean and rinse the mussels extensively. Grate the ginger, the garlic, the lemon grass & the red chili’s. Cut the celery and the shallots. Heat the olive oil in the wok and braise the onions and the garlic. After a few minutes, add the rest of the grated ingredients. When this mix has baked shortly, add the mussels, the white wine, the fish stock, the fish sauce, the trassie, the lemon leaves and season with salt & pepper. 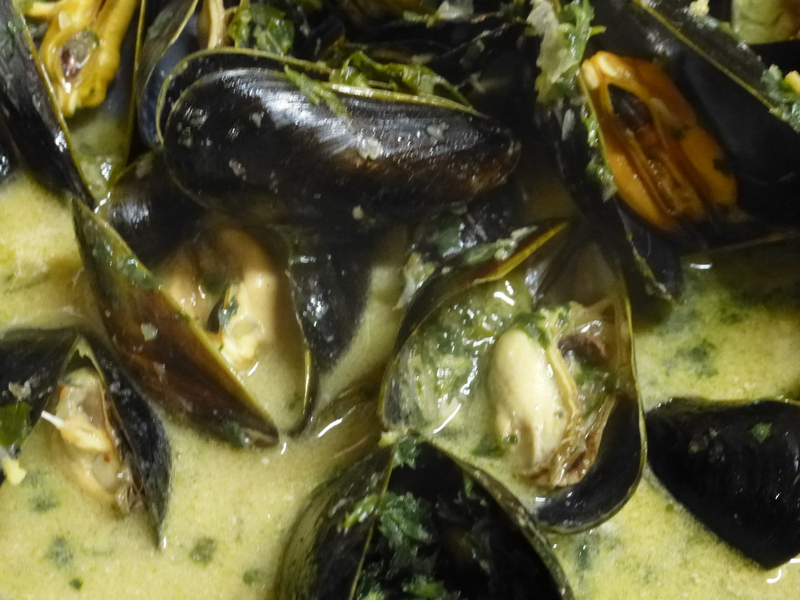 Close the lid and cook until the mussels open (typically 10 minutes). Now add the juice of 1 lemon and the coconut milk and stir to disperse the taste. Add the coarsely chopped leaves of the green herbs, stir and serve immediately. The secret is the trassie (shrimp paste), this Eastern ingredient really lifts the taste of the mussels. We serve these mussels as a starter with some bread to dip in the juice. But us Belgians like mussels in many styles as a main course and then we typically prepare 1 kg mussels per person. Although the standard in Belgium is mussels with frites, these Thai style mussels come out much better with good bread like Turkish pide. If you don’t like grating ginger, use a small blender to cut ginger, chili, etc. This entry was posted in Appetizer, Fish, Fusion and tagged coriander, ginger, lemon, mussels, spicy, thai, trassie by petratant. Bookmark the permalink.